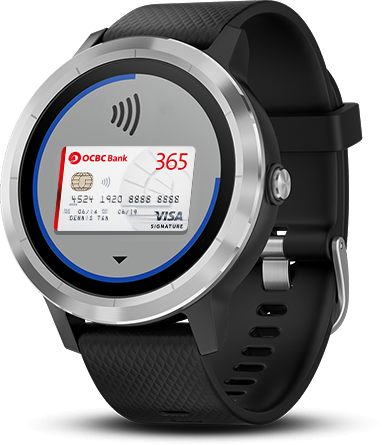 ocbc cards with garmin pay™. Don't have an OCBC Card yet? Click here to apply. Download the Garmin Connect Mobile app and set up your Garmin Pay Enabled device. Tap on Garmin Pay and follow the on-screen instructions to add a card to your wallet. 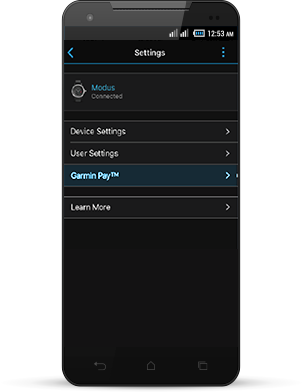 Your Garmin Pay Wallet will now appear on the main menu, and you’re done. Ready to pay? 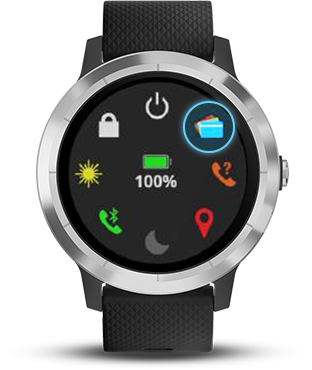 Press and hold the Action button on the right of your watch. Tap on the Wallet icon. Swipe up or down to select the card you want to use. Hold your watch near the reader. When the transaction is successful, a green tick will appear. 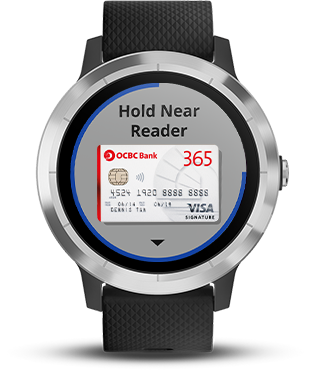 Garmin Pay is accepted at all places where Contactless Payment is available. Look out for this sign to pay with OCBC Cards on Garmin Pay. 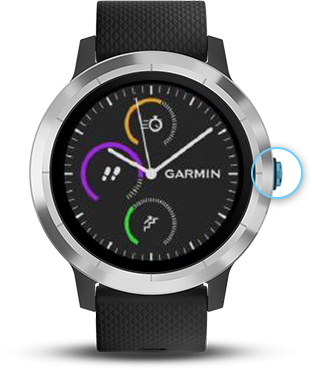 Garmin Pay is currently enabled on the Vivoactive 3 device only. The Garmin Connect Mobile app is accessible on Apple and Android devices. Click here to check your phone compatibility. 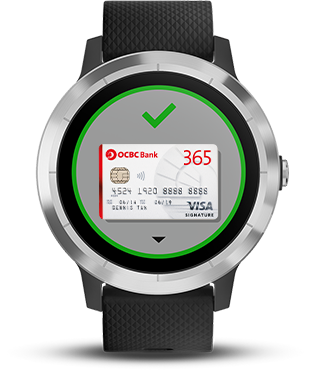 Garmin Pay is currently available for Vivoactive 3 smartwatch only. 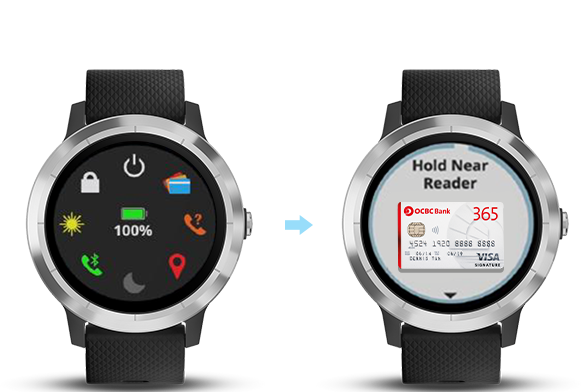 Garmin Pay is a trademark of Garmin Switzerland GmbH.Screen images are simulated and for illustration purposes only. There may be links or hyperlinks in this page which link you to websites of other third parties (the “Third Parties”). OCBC Bank hereby disclaims liability for any information, materials, products or services posted or offered on the web-site of the Third Parties. OCBC Bank is not responsible for and makes no representations or warranties in respect of the Third Parties’ websites, nor in respect of any products, services or information provided by such Third Parties. OCBC Bank shall not be responsible or liable for any damage, loss, liability, expense or other consequences suffered or incurred by you, including without limitation, direct, indirect, special or consequential damage or economic loss, arising from or in connection with your access to the Third Parties’ websites.